In transit – on the way. Travelling into the future, across town or from state to state, the Ford Transit will get you there. The Ford Transit is a well-designed and engineered van suitable for a wide range of commercial purposes. Solidly built, it has German genetics in its DNA. Walk up to this van and it is clearly obvious that the Ford Transit was made to carry things. Space abounds, and if you haven’t driven a van before, to hop in this and drive it, you will enjoy the feeling of roominess, comfort and practicality, not to mention the commanding view one gets of the road ahead – and behind with the wonderfully large rear vision mirrors. 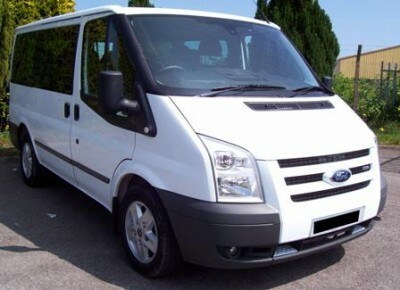 Pleasant to drive, and smooth and responsive, the Ford Transit sits at the top of the van class. The various models in the Ford Transit line-up will cover an extensive range of body shapes. Whether you are butcher, baker or candlestick-maker, a plumber, a postie or a paramedic, you will find a Ford Transit to suit you. There’s a short wheel base van (4863 mm in length), a medium wheel base van (5230mm), a long wheel base van (5680 mm), a Transit Jumbo van (6403 mm), a Transit chassis cab (either 6031 mm or 6385 mm) and a Transit bus (5680 mm). You can have a choice of a low, medium and high roofline. A van like the Ford Transit that weighs in at well over two tons needs to have a strong and reliable motor that can deliver smooth power. Available to the short wheel base and medium wheel base models only, is a wonderfully compact and powerful 2.2 litre TDCI engine. The 2.2 litre motor five-speed manual copes manfully with heavy loads and uses it’s 81kW @ 3500 rpm and 285 Nm @ 1750 rpm through the front wheels very efficiently. You can however opt for the rear-wheel driven 2.4 litre TDCI engine on any of the model variants. These Ford Transit models have the more powerful 2.4 litre TDCI engine with a six-speed manual transmission, and the engine delivers a maximum output of 103 kW and 375 Nm of torque, which is a commendable level of grunt that is handy for shifting very heavy loads. All the models in the Ford Transit range have a nicely weighted power assisted steering unit that gives good feedback and confidence to the driver. The suspension, which consists of independent MacPherson struts at the front and leaf-springs in the back, minimises load disturbance and deals with varying load weights. Each model has an anti-roll bar as standard at the front to hold the Ford Transit securely upright on the road. The Jumbo van and the Chassis Cab variants have a rear stabiliser bar as well. The Ford Transit is good for your luggage. Is it good for you? Well, yes. The front seats have to be comfortable when many miles have to be covered by a busy driver, and there’s a pivoting arm rest for the driver, along with the seat being manually adjustable six ways. Cloth trim is standard, and two handy bottle holders mean that you’ll be able to quench your thirst driving in the heat of the day. Each model of the Ford Transit has plenty of side storage compartments, and they come with a central slot for one A4 clipboard, so you’ll always know exactly where you’ve put it. There’s a power socket in the driver’s top storage bin – very handy for charging up laptops. Air conditioning is optional for all models except the Ford Transit bus, which has air conditioning front and rear as standard. The driver’s seat is heated, and a good CD sound system is standard on all models of the Ford Transit, giving you something to whistle along to while you work. Airbags are standard for the driver only on all models except the Ford Transit bus, where a driver and passenger airbag is standard. A passenger airbag is optional on all other models. When it comes to travelling via van, the Ford Transit is a sound choice that would be a worthy addition to any commercial fleet or for a sole operator. For any more information on the Ford Transit, or for that matter any other new car, contact one of our friendly consultants on 1300 303 181. If you’d like some fleet discount pricing (yes even for private buyers! ), we can submit vehicle quotes requests out to our national network of Ford dealers and come back with pricing within 24 hours. Private Fleet – car buying made easy!